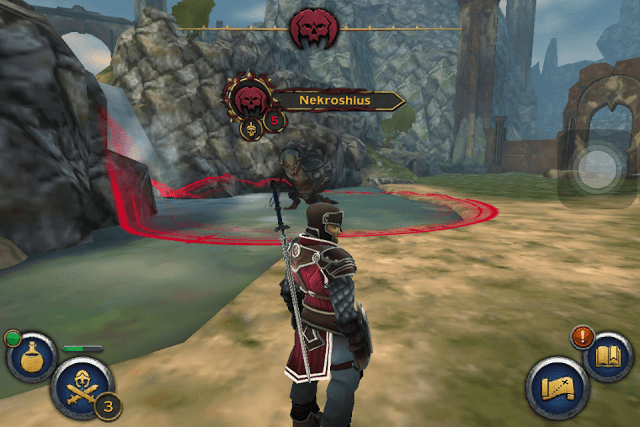 A year ago, Kiloo Games launched Stormblades, a hack-and-slash fighting game with RPG elements. 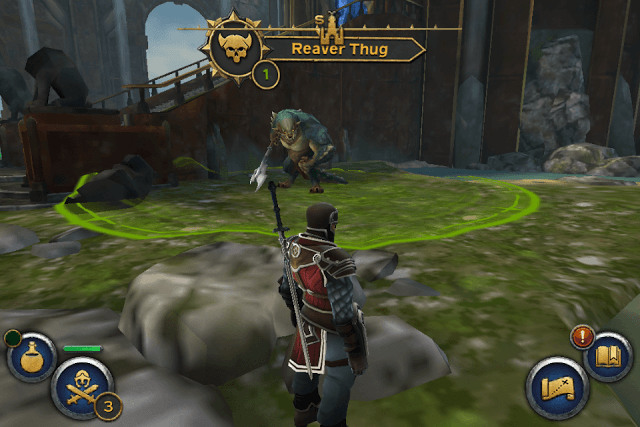 Dawnbringer provides the same “swipe to slash” style of gameplay, but the developers have introduced several new features, including exploration and a nice plot. 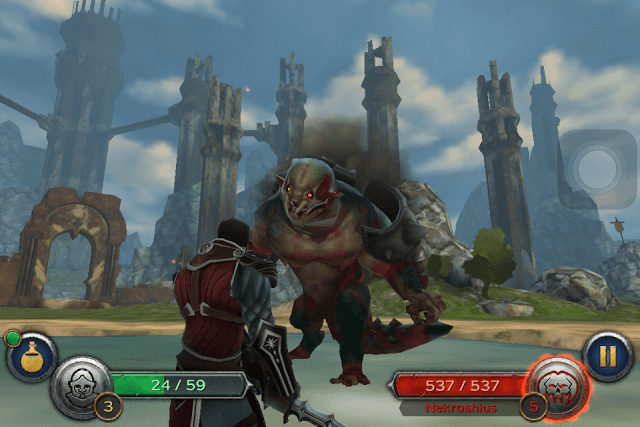 You will explore the stunning 3D world of Mourngard, where demons roam free and you will have to get rid of them to bring it back to its former glory. After parrying an incoming attack successfully, quickly swipe two or three times to launch multiple attacks. 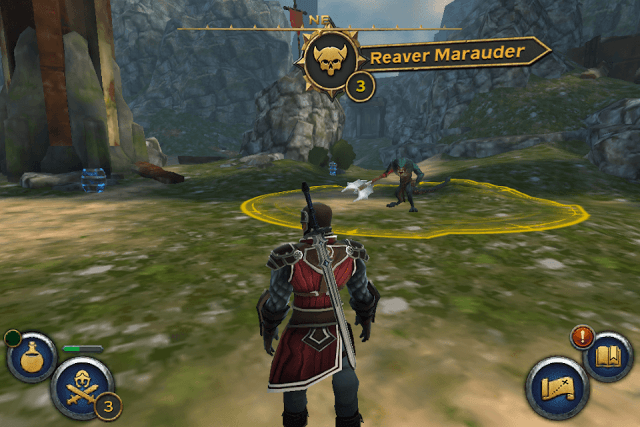 Your goal is to reduce your enemy’s HP as quickly as possible before his next attack. You will have to be quick as you will have to defend and block his strike by swiping in the opposite direction. Most enemies strike slowly and this will give you enough time to attack more than once. After a perfect parry, I rapidly swipe left, right and left to get three attacks before stopping another attack. With upgraded gear, it would be easier to kill enemies having green and yellow circles around them. You may have noticed that every demon is placed on a circle and you begin battle when you enter it. Demons with green circles are easy targets. They inflict less damage. You don’t even have to parry their attacks every now and then. You just have to swipe left, right up in any direction rapidly to drain as much blood as you can and then can try to block incoming attacks occasionally. Try not to drink potion after encountering “Green” circle enemies as your hero’s HP loss will be minimal. 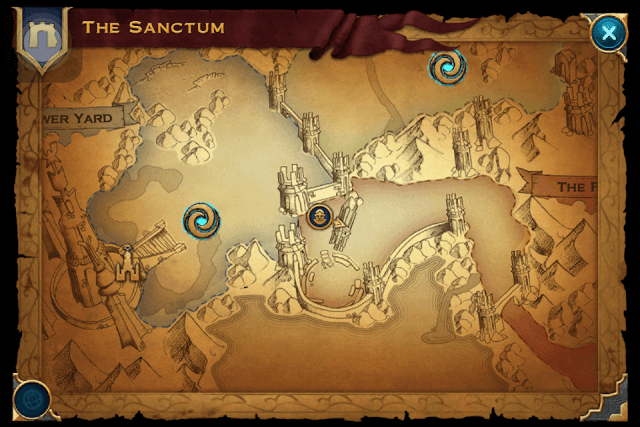 Save potion and potion drops scattered around the Sanctum for hard-to-beat demons. Demons with yellow circle around them can also be defeated easily. At first you can parry a few incoming attacks and when you are ready, you can swipe left right without stopping to drain as much blood as you can. They usually are of medium difficulty and you should have an upgraded sword, helmet and armor if you want to eliminate it without taking much damage. They are easy to kill, but your hero’s HP will decrease after each hit, so make sure his HP is full. Demons having a red circle around them are usually “boss” demons that are very difficult to beat. You will have to parry incoming attacks a lot and may even have to brace for surprise moves. They may swing diagonally, stun your hero for a few seconds, move in a circle and then attack from left to right or right to left. A demon’s level can be seen just below its name. If the demon’s level is more than your hero’s level, expect a tough challenge ahead. You can check your hero’s level at the bottom left corner of the screen, on the helmet/sword icon. 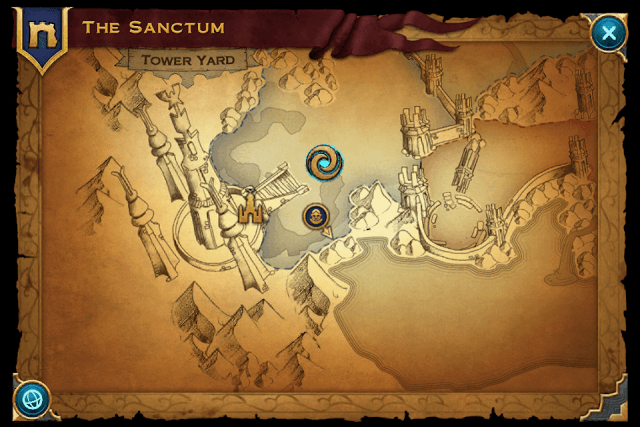 Before entering the red circle, make sure your hero’s HP is full and you have a spare potion with you. Make a potion and use it when your hero’s health is low. Also, upgrade your hero with materials that you have accumulated so far. You will get rare materials from chests. Your fast-paced swipes after parrying an enemy’s attack can be more effective if you have an upgraded sword. An upgraded sword inflicts more damage as its attack rate increases with every upgrade. To upgrade, tap the icon next to the potion icon and then tap the sword icon. At first you will have to spend crystals to level up, but later you should also have Black Iron to make your sword stronger. You should also upgrade other items such as the helmet and armor, along with sword. Upgrading the helmet will increase critical damage by a certain percentage. Upgrading armor will boost Defense, making it easier for your hero to withstand damage from demons. 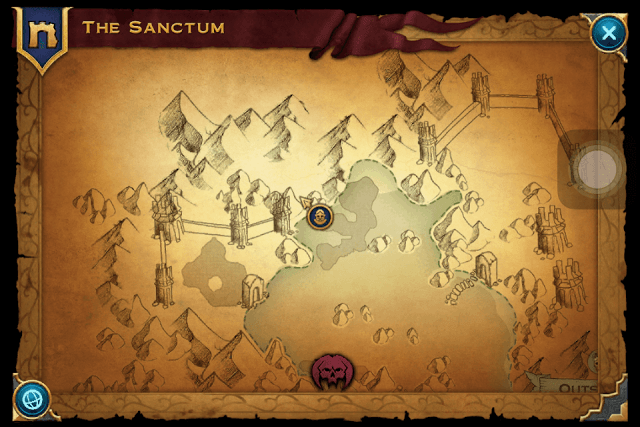 Keep an eye on these locations as chests may appear more than once in a day. Urns, barrels and crates are scattered everywhere and they usually contain crystals, which can be used to brew potions and upgrade gear. When you complete a quest in Dawnbringer, you get XP. You also earn XP when you defeat a demon. 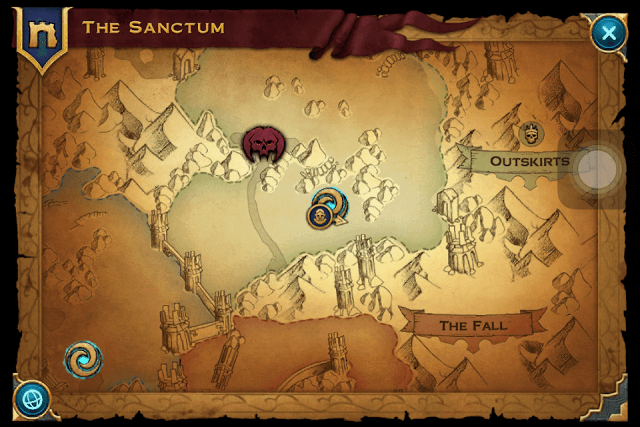 Demons will keep spawning in Outskirts, the Fall and other regions. So keep battling those demons that have green and yellow circles around them as they can be defeated easily and your hero will take less damage. After every defeat, your hero will earn XP. Keep collecting XP to fill your hero’s XP meter and once it’s full, your hero levels up. Leveling up increases your hero’s health cap. Increased health will help your hero withstand attacks for a longer time.